If Pink Floyd had been locked in a studio with a large collection of folk instuments, this is the sort of music they would have made. 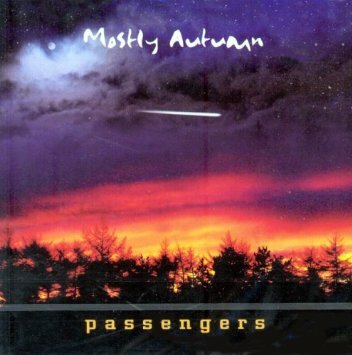 Mostly Autumn are one of the most creative and original young bands to emerge on to the rock scene for many years. With a blend of progressive guitar and keyboard sounds they create a framework on which to hang all those instuments that don`t normally get an airing in this field, violins, flute, cello, bodhran, whistles and even the bazouki. But dont be put off by that, its very much a rock sound, even at its gentler moments. Passengers is their fourth album and continues in the same vein as their previous releases, thats not to say it is in any way repetitive or derivitive, its just that they do one thing very well and until they have full explored all the possible angles, have no need to drastically change their style. The Pink Floyd connection is a bit misleading, I guess, whilst some of the guitar passages wear that prog-rock hat with ease, they are a lot more than just a bunch of old school rockers with a guitar fixation. All the instruments have their fair share of the glory and the icing on the cake are the vocals. Heather Findlay has a georgeous voice, hints of All About Eve`s, Julianne Regan are there and whilst she has always shared vocal duties with guitarist Bryan Josh, this album sees her taking on a more dominant role which I, for one, like. Thats not to say that there is anything sub-standard about Josh`s voice, its just that some of the music lends itself more to a female harmony, that said there are some lovely joint harmonies on such tracks as Simple Ways and Answer the Question. This is music that does not sit in any time frame, it could have been made anytime in the last thirty years, if it wasnt for the modern production of the album. It will definatly appeal to the old school and classic rock fraternity, there are hints of Tull, Fleetwood Mac and much of the approach reminds me of little known Irish band Celtus, whom I can`t recommend highly enough. The music is so wide ranging that it is difficult to find comparisons that sum them up, but that is for the good and shows an originality in their music. Without dwelling on specific tracks the music blends all the instruments into a unique range of sounds, here a flute takes the dominant role, next single piano notes or washes of keyboards, take over, and the next moment you are whisked away by a driving rock guitar. The songs use that progressive frame of having unexpected changes of pace and timing, not for them the verse, chorus, verse, chorus, solo, chorus, and relax format. These are finely constructed songs, music that has an purpose and identity of its own. It a time when music can be as shallow as a vehicle for a bunch of catchy words, or words are just something to put on a catchy tune, the depth of the words and the music stand out, both are strong enough to exist without the other. Music that moves from haunting vocal one minute to big operatic multi instrument arrangements the next, is a rarity these days, and this band are experts of the change of pace and direction. The music is exquisit, the lyrics range from the human eye view to the mysteries of the universe, all delivered with subtlty and finess. If Progressive Rock conjures up images of Rick Wakeman dressed as a wizard, or fourteen hour guitar solos, then this is an album and a band to re-educate yourself with.